Saying it is only appropriate smokers are informed of the dangers of vaping, Senator Joseph Victor (JV) Ejercito has sought passage of a bill regulating the sale, distribution and use of electronic cigarettes, which he said, poses serious danger to adult consumers. 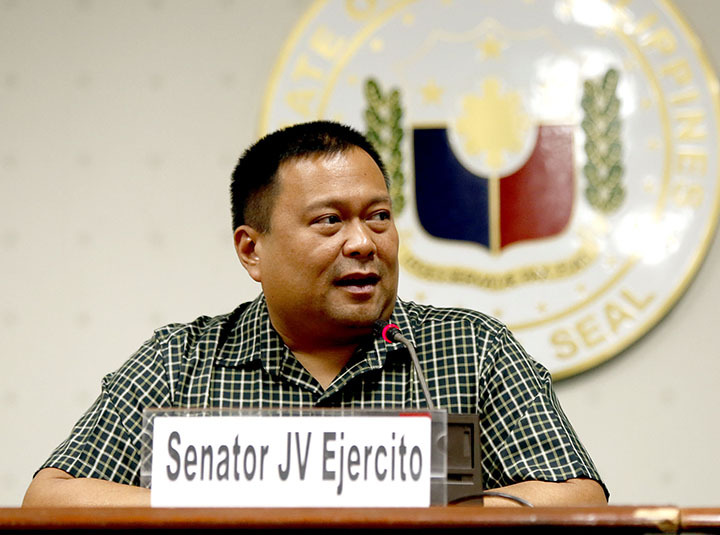 Ejercito, chair of the Senate committee on health and demography, said that most Filipinos are unaware of the dangerous effects of vaping.. Because of this, the government should put in place a mechanism controlling the use and distribution of e-cigarettes. “However, they are not completely harm-free. These products still emit potentially harmful toxicants in the vapor if expressed at high levels. There needs to be a form of regulation for such products in order to protect the interest of public health,” Ejercito stressed. Ejercito said a study released by the US Public Health Service and the American Lung Association, show that the e-juice being used in vaping—which is commonly composed of propylene glycol, nicotine and flavorings—releases harmful emissions that are observed at high-levels in conventional cigarettes. Ejercito said the actual act of using e-cigarettes—or vaping—poses potential harm to youth with its addictive properties. “Action, therefore, must be taken at the national level to prevent access to e-cigarettes by the youth and regulation of its marketing that should not be directed to attract minors,” he said. “This will take the form of restricting age sales, prohibiting minor use, and policing marketing rules to ensure that promotions do not target minors as well as undermine smoking cessation messages,” added the lawmaker. As far as he is concerned, Ejercito said regulation on the use, sale and distribution and advertising of e-cigarettes are wanting. Thus, he said, it is necessary that consumers be assured by producers of the quality and safety of such products and informed of the components found in the same. Additionally, Ejercito said there have been incidents of exploding batteries or defective electrical systems related to the use of e-cigarettes, which need to be addressed. “Moreover, adult consumers should not be made to believe that such products indeed have the propensity for harm reduction due to smoking, and producers and distributors should not be allowed to freely claim nor indirectly imply that such products are safer alternatives, in the absence of any definitive finding and approval by the proper government authorities,” he said. In pushing for the measure, Ejercito said the government must require producers to register their e-cigarette products with the Department of Trade and Industry (DTI) prior to market placement to ensure that such products have sufficiently passed quality and safety requirements and avoid untoward incidents to consumers during use. If passed into law, e-cigarette producers are likewise, mandated to give consumers a health warning by putting a disclaimer: “This product may damage your health and is addictive” on nicotine containers of these products. “In the interest of public health and safety, there must be legislative action to vigilantly regulate e-cigarettes given the lack of scientific foundation to substantiate claims of safety and quality,” Ejercito said.